Jimmy Beans Wool is proud to present Sew Red, the stunning follow-up to Laura's (aka Jimmy's) first book Knit Red. 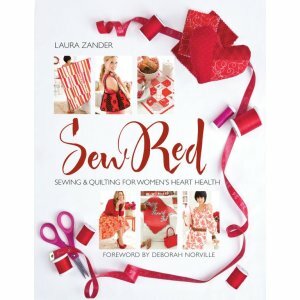 Sew Red features gorgeous designs from more than 25 of the top sewing and quilting celebrities, two 28 x 40 black-and-white pattern sheets, heart healthy tips and recipes, amazing photography, and personal stories shared by the designers themselves. Each showcased designer-which includes celebrities like Amy Butler, Denyse Schmidt, Anna Maria Horner, Ty Pennington, and Kaffe Fassett- shares his or her experience with heart disease and offers tricks for staying healthy. We hope you will enjoy sewing the projects from this very special health-minded book! To make this book even more special, every copy we send out will be signed by Laura Zander. Jimmy Beans Wool has agreed to contribute a minimum of 5% of their gross profits from the sale of this Stitch Red product to the Foundation for the National Institutes of Health in support of The Heart Truth® and women's heart health education and research. Joji Locatelli and Veera Valimaki Interpretations - Volume 6 and Rowan Kim Hargreaves Pattern Books - Form are both similar books: women category.